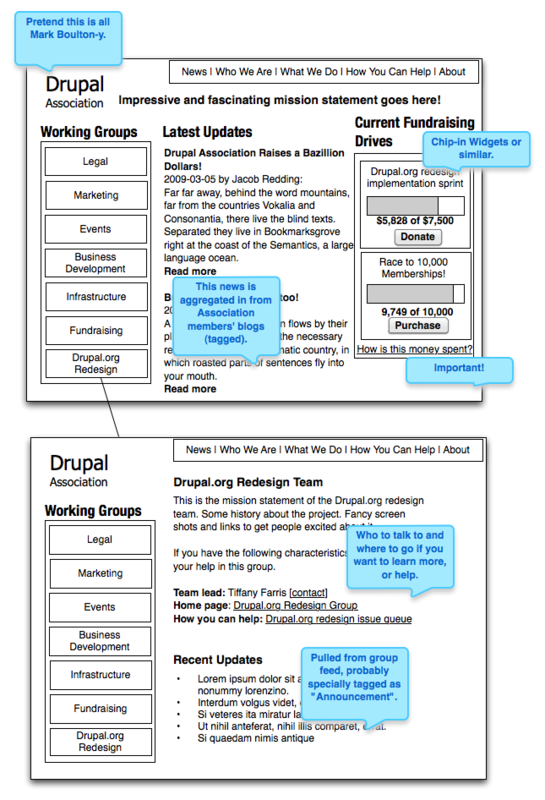 Ideas for the Drupal Association website, version 2.0? Now that the Drupal.org redesign is underway, Neil Drumm is currently collecting suggestions for what a revamped Drupal Association website might look like. 1. Outdated news you already heard somewhere else first. Unfortunately, there is very little emphasis on "awesome stuff the Drupal Association is working on and how you can help." That's something I think we need to change, to both help give the community assurances that their money is being spent wisely, and also to give the larger Drupal community on-ramps to directly help the Drupal Association members achieve their mission of supporting the Drupal project. 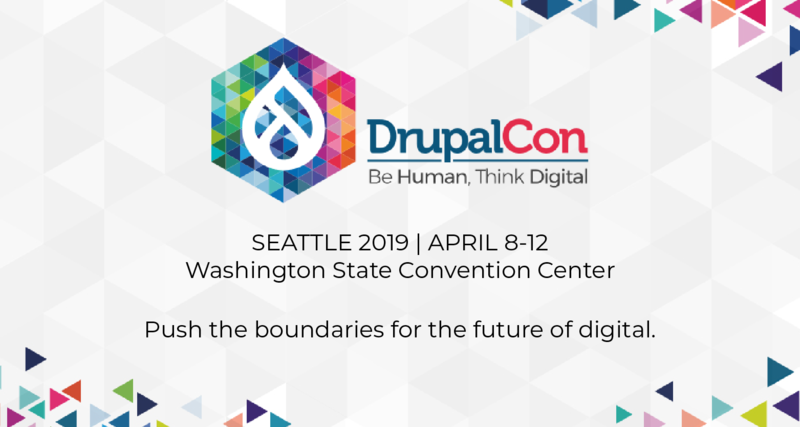 The idea is to both emphasize larger spheres of responsibility that the Drupal Association has, and also highlight both what's happening NOW as well as an archive of what we've achieved in the past. How about yourself? Do you have thoughts on what you'd like to see in a revamped Drupal Association website? Want to play wireframe ping-pong? I'll collect any responses given here and send them off to Neil on Wednesday, March 19. These are very good ideas Angie. In addition to these changes, for all the "Static" pages of the Association web site, I'd like to see their translations. The Association web site should be the first Drupal web site using the various internationalization features. I would espcially appreciate translation of all donate and memberships pages. Of courses, blog and other news items would not need to be translated. They could optionally be translated from time to time by volunteers. I am also in favor of Internationalization but I think we need make awareness to the developers that how important an internalization is. +1 for fundraising drives being featured prominently. +1 for translation - would be happy to offer time for translation to Italian of the main aspects. I don't know how "live" the website should be - for example should the working groups report on the association website or the main drupal.org. Makes sense to list any such groups and provide pointers to where to find more info - but it seems to me group.drupal.org and IRC is where new issues get reported. Perhaps the working group pages could pull in feeds from other places. The overall purpose of the association website should be to make clear the rules and regulations, who current members and leaders and also how you can become an association member - perhaps also giving paying members some chances provide more info about their company, etc to motivate paying for it, introduce even more tiers, sponsors, etc. This week brought some very welcome news to Drupal fans around the world. The Drupal Association was formed putting a more business front end on the Drupal development community. All of the cool FOSS kids are doing it. I really like this so far; it really helps to bring a more active approach to the Association. Since the issue queues now have RSS, it would be really neat to have an aggregated feed of the last x "fixed" issues related to a.d.o working groups somewhere. That way casual visitors would always see the flurry of activity which is happening, but isn't immediately obvious. I also think "Become a member" needs to be prominent in the primary menu. We have under 1,000 memberships and we have 400,000 users, give or take. Perhaps we should create a moving target widget. Once we get to the last 25 percent, it can raise the bar by 50 percent. @Jacques: Having translations of all of the website's static content is a great idea! I think we might need lawyers to translate the statutes, but everything else should be fair game. @Ronald: Thanks a lot for your comments about memberships. I agree that this needs to be promoted much more than it is, along with benefits and "why should I do this?" etc. clearly spelled out. @Andrew: Yeah, I like your order of working groups much better! I'm not sure in practice how pulling in issues might work (the marketing team doesn't really have an issue queue, for instance), but I really like the idea of showing a constant stream of activity to show people what's going on. This would be the perfect opportunity to implement a brainstorm.ubuntu.com clone based on IdeaTorrent. PS. Really love your book "Using Drupal", amazing! A forum where members can discuss the policies and direction of the organization. Access to this forum would be a concrete benefit of membership. One of the Permanent Members would have to be tasked with monitoring the forum and alerting other Permanent Members with relevant portfolios to attend to the forum when their portfolio's issues are being addressed. There is a need for a FAQ item which translates the association terminology into "North American" and possibly other NPO "dialects." The structure section is horribly confusing for a North American to read. For one thing, in North America "Staff" means "people who are paid to work for the organization." My assumption has been that "Staff" positions in the Drupal Association are volunteer. Assuming I'm correct, that fact needs to be "translated" for North American readers. I'm just picking on one point here. The Board needs to ask someone who isn't a permanent member to read over the "structure" section very closely and ask for feedback about how it can become coherent to a non-European. I'd be happy to volunteer in that effort. Not just at election time, but all the time, there needs to be information about how one becomes a Permanent Member. A date for the next election cycle should always appear on the structure page. You have to download a pdf to find out that "admitted" membership is good for 1 year. Is that a calendar year? Or is it a year from when one joins. Mine expired without me ever getting a renewal notice. (Or maybe I never bought one, but I'm almost sure I did... That information wasn't accessible from the "my account" button, which it should be. Part of being transparent is by being explicit about what is not available to the public or to Admitted Members. For instance, I don't see minutes from the Board posted on the web site. It should be stated somewhere that it is the policy of the Drupal Association to keep board meetings private. Even if that fact is buried in the legal pdfs, it shouldn't only be there. I realize that a chunk of the post may be "out of scope." But as with the work we do for our clients, building a new web site can often raise issues about how we do our business and not just what features we want on our web site. It's great that the Drupal Association is working on itself! Thanks Angie for all your efforts. Hi would wish for my business more interfaces to commercial suppliers. This is not a wrap up post about DrupalCon Barcelona (I'm notoriously bad at those, with all these fresh ideas swirling in my head instead), but rather a post about the Drupal Association. hi its a nice post sir.thanks a lot for your great effor.so please keep posting a new article.Thank you sir. Googlebot is a frequent visitor(*) of drupal.org, eating over 50GB of traffic in over 11 million requests in March. I didn't know that the postprocessing is also quite fast. You amazed me fellow its seems like drupal is best for us because its indexed faster then any. New Drupal Association Site Design CONTEST?? But if you come up with something cool we could ALWAYS use more beautiful contributed themes! And it'd be a great way to get your company's name out there in the larger Drupal community, and may also lead to jobs as well (like what you see? we can do that for your site too. Contact us at ... etc.). The idea is to both emphasize larger spheres of responsibility that the Drupal Association has - it is evident. They could optionally be translated from time to time by volunteers. I would like to see chat option in drupal association website so that users can interact in realtime. this is great information that i know a lot of people are interested in. yeah its a great idea. Well done. There isn't so much tasks as you think. A fulfillment service can handle shipping, customer service, product creation. We definitely must outsource these tasks. Does Cafepress handle these? 1) Mark the existing store as the official Drupal store, or create a new one. 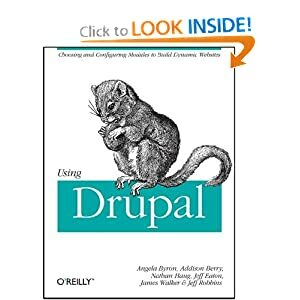 This page says now: "Drupal does not have any official merchandise; domain names however since the Druplicon logo is licensed under the GNU GPL some people have taken it upon themselves to make their own." This is a mistake because people buy more likely from THE official Drupal store than from any other. * Who receives the revenue from the Drupal Store? I payed X $, exactly how much will Drupal earn from my order? * How will the revenue be spent? * How can I order? * How long will it take to get my order? * How can I track the status of my order? * Do you ship internationally? How much does it cost? * I live in country X. How much tax should I pay? * Do you offer money-back gurantee? * I got my order, but it is broken/does not fit my size, what to do? * Do you offer volume discounts? * Where can I get customer service? 3) Setup a subforum for questions/feedback, and future product ideas for the Store. 4) Integrate and design the shop. Right now if you click on an item, you will be automatically redirected to Cafepress. Is it possible to integrate the shop? dsl The buyer should only be redirected to the fulfillment serive checout, when he/she finished the shopping. Because if the buyer are on Drupal.org while shopping, then it is more professional. We need also design the shop. 5) Come up with more products: woman's T-shirts, mugs, Pen Drive, bags, caps. We could also integrate the books about Drupal node (http://drupal.org/books) into the shop. 6) Create a new primary link pointing to the Drupal Shop. It should be better promoted. We can design a few banners promoting the shop as well. Of course you can criticize this post, these are only my ideas. Drupal is really supportive for 2.0 website..there theme..template..design..too good...really like it.. There are so many interesting things and cutting edge developments happening with Drupal that it's hard to keep track of it all. The big question is if the Drupal association will be directly involved with the evolution of the code. The Drupal Association has no say in either the planning or development of the Drupal open source project itself. This is left solely in the very capable hands of the community. That's great to know! Roopal Saran is the Director of Client Services at KaBOOM!, a nonprofit with a vision of creating a great place to play within walking distance of every child in America. The Drupal Association was formed putting a more business front end on the Drupal development community. All of the cool FOSS kids are doing it. I think Drupal Association is currently moving forward to be the toughest competitor of Wordpress. I personally like their Dating Templates, something for me to use on my website.